By all accounts the state Supreme Court election in 2012 proved to be one for the record books. More money than ever poured in to help re-elect one justice and secure a conservative majority on the court – with most of those dollars coming from groups far from the state’s borders. Records set then are likely to be shattered in 2014, though, as more candidates are running for more races and as more outside groups find the path to influencing the outcomes of those races eased by recent election law changes. For conservatives, the coming races will be about adding to the Republican presence on the court. But for progressives, who are challenging much of the legislation coming out of the conservative playbook in the courts, everything could be at stake. Just one seat on the state supreme court was at stake in 2012 – that of conservative justice Paul Newby – but it was a seat that mattered intensely to both Republicans here and political operatives nationally. That’s because the GOP lawmakers’ recently enacted redistricting plans had expectedly landed in the courts, and maintaining their Republican 4-3 majority on the state’s highest court was critical to ensuring the life of those plans. 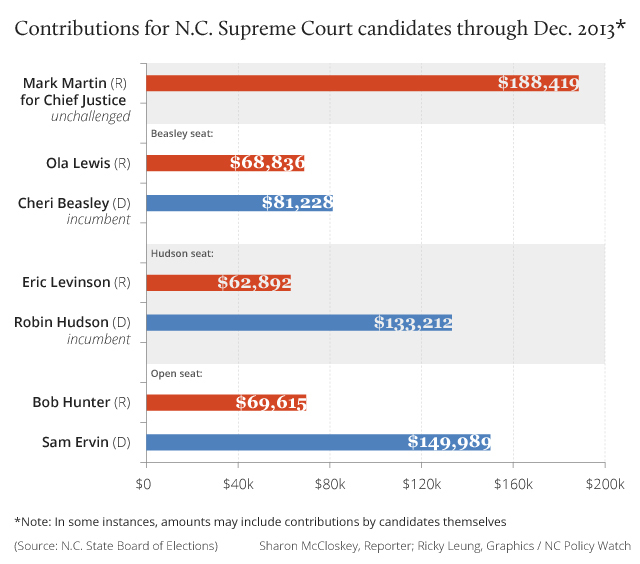 While Newby and his challenger, Court of Appeals judge Sam Ervin IV, limited their fundraising to the individual contributions needed to receive support from the public financing program, outside political money poured in, especially during the waning weeks of the campaign when the polling numbers got tight. In the end, spending for that one seat topped $4 million, according to a report by Justice at Stake, the Brennan Center for Justice and the National Institute on Money in State Politics. Tracing that money to its original source proved to be no easy task, as dollars passed from corporations and political groups through one super-PAC and then another. 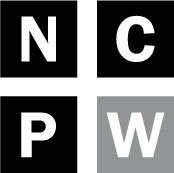 The Republican State Leadership Committee in Washington, the group spearheading local GOP redistricting efforts, gave more than a million dollars to the newly-formed Justice for All NC, which in turn passed that money along to the North Carolina Judicial Coalition, the group responsible for the late-in-the- campaign media blitz in support of Newby. Together with dollars from the North Carolina Chamber of Commerce, R.J. Reynolds Tobacco, the North Carolina Republican Party, and other groups, the Judicial Coalition spent nearly $3 million to help Newby retain his seat, including close to $2 million for the now famous Newby banjo ad, which aired more than 1600 times on local media in the weeks just before the election. Without question, the enactment of the so-called “monster voting bill” in 2013 has radically changed the election landscape in North Carolina — judicial races included. For one thing, candidates will have to do a lot more fundraising, as the state’s highly acclaimed public financing program has been eliminated. At this point in prior election cycles, judges seeking a seat on the high court would be nearing the end of that task, raising the $80,000 or so in individual contributions needed for the $240,000 boost from that program. Now, though, that help is gone, and candidates are facing a long and arduous fundraising cycle – a chore that few relish and one that takes time away from their judicial tasks. An increase in the individual contribution limit from $1000 to $5000 may help, but overall that means more money flowing into judicial elections by those who, well, have more money. And the “dark money” influence by outside, hard-to-identify political groups and special interests will increase, as advertising disclosure rules have changed. Those groups can now spend unlimited amounts on negative attack ads during the summer leading up to the election without disclosing the source of funds for those ads to the public or the State Board of Elections. Even the disclosure that’s still required, starting in the September of an election year, is limited. No longer must print ads and mailers include a list of the top donors financing those materials. Apply those changes to a race involving seven candidates for four open seats on the court and what do you get? A potential circus in place of what should instead be a controlled and open contest for a position many call the most critical to a democracy. Justice Mark Martin kicked off the 2014 Supreme Court election cycle in December 2012 when he organized his campaign to run for the Chief Justice spot being vacated by Sarah Parker, who will turn 72 on August 23, 2014 and must step down by the end of that month. He’s made good use of that year, hauling in $188,419 in mostly individual contributions and giving him a leg up on his challenger – if he had one. But he doesn’t, giving rise to questions about whether Martin really needs to keep fundraising and what he’ll do with any unused funds. The battle for Martin’s seat, in turn, will be an East v. West, Republican v. Democrat fight between Bob Hunter from Morehead City and Sam Ervin from Morganton. Both have served as judges on the Court of Appeals since 2009. The remaining two spots belong to sitting justices Robin Hudson and Cheri Beasley. Hudson, a Democrat, is seeking re-election after serving a full eight-year term. Mecklenburg County Superior Court Judge Eric Levinson, Republican, is challenging her for that spot. Cheri Beasley, a former Court of Appeals judge who was appointed to the Supreme Court by Gov. Beverly Perdue in December 2012 to replace then-retiring justice Patricia Timmons-Goodson, is being challenged by conservative Brunswick County Senior Resident Superior Court Judge Ola Lewis. Campaigns for all of the candidates are up and running, and fundraising is in full swing. Through the end of 2013, though, none had come close to the more than $300,000 they would have amassed had public financing been available. In many ways, the 2012 election became a single-seat, single-issue race, with maintaining the Republican majority on the high court the driving force. Conservatives at the state and national level viewed that outcome as critical for redistricting purposes, but it also appealed widely to corporations and other groups whose social and economic interests aligned with those of Newby and his like-minded colleagues on the court. That’s not the case this time around. Absent some unforeseen event, the conservative majority will remain intact, given that the justices not up for re-election – Paul Newby, Robert Edmunds and Barbara Jackson – are Republicans, and Justice Martin, also a Republican, has no opposition for the Chief Justice slot. And with several conservative issues in addition to redistricting – vouchers, teacher tenure, and the Racial Justice Act, for example – making their way to the high court, that’s good news for Republicans. For Democrats, the outlook is not quite as rosy. Although advertising money may prove to be a challenge for both parties — as outside groups may find having to spread funds among multiple candidates less impactful and, as a result, scale back — Republicans already have a proven track record of garnering needed support from national groups. 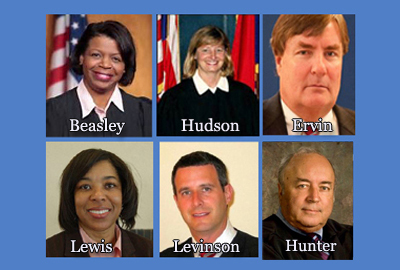 The Democratic justices, Hudson and Beasley, will have the incumbent edge, and Ervin proved to be a formidable candidate against the well-healed Newby in 2012. But Hunter will give Ervin a run for his money, especially if he gets a boost from the governor appointing him temporarily to serve in Parker’s seat, as some have predicted may happen. Certainly nothing is guaranteed, given the changes in funding and disclosure and the apparent willingness of outside groups to drops millions in support of state judges. And nothing should be overlooked, including this possible outcome: Republicans sweep the judicial races, and control the state’s Supreme Court, 7-0.